Against the backdrop of the instability, volatility and general panic of the euro zone financial crisis, Germany has stood out as a successful, stable nation. While a number of European countries have reached the brink of total collapse, Germany has not only adapted to the deteriorating economic conditions of the continent, but has actually performed well. Since 2007, Germany has had the highest or second-highest GDP growth rate among G7 countries for all but one year. This is even more impressive given the context of Europe’s worsening economic condition. Increased economic responsibility has accompanied Germany’s economic success. The European Central Bank cast Germany as the decisive factor in allocating funds to avert the catastrophe that would result from European governments defaulting on their debt. Last fall, Germany agreed to underwrite $267 billion in European bailout funds. However, German voters against the bailouts outnumber those in favor by a two to one ratio, and therefore Germany’s willingness to contribute to bailouts in the future will undoubtedly be in question. Given that these bailouts are crucial to avoiding a deeper crisis, Germany has become the most important player in the European economy. This economic reality is common knowledge for those who have been following the euro zone crisis for the last year. However, an oft over-looked corollary of this economic power is the political power that it affords Germany. By being the biggest player in European economics, Germany has become perhaps the biggest political power in Europe as well. 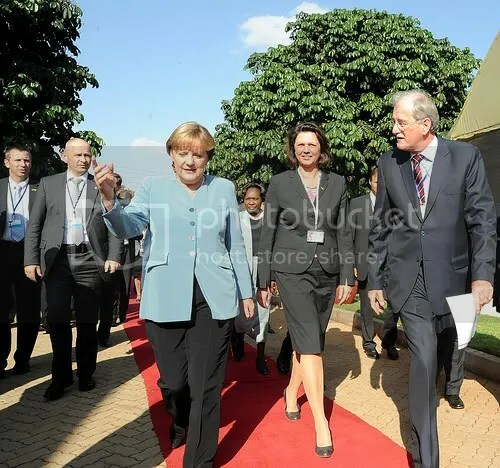 For example, in the lead-up to the most recent European summit, Antonis Samaras, a Greek party leader who had publicly questioned the conditions of the EU-IMF bailout, met with German chancellor Angela Merkel. Directly after this meeting, the previously belligerent Samaras capitulated to the conditions. Germany’s political power had an obvious effect on Samaras’ change of heart. Germany is also exercising its new-found political power in Eastern Europe. In a speech in Berlin last November, Poland’s foreign minister pledged to support any German plan for saving the euro, given that Germany merely “consulted” with Poland. Furthermore, Germany has significant sway over the smaller ex-communist countries of Eastern Europe; by controlling the EU budget for 2014-2020, Germany can allocate development funds for infrastructure projects that these countries covet. Furthermore, French President Nicolas Sarkozy paraded his relationship with Chancellor Merkel’s support for him in a January interview; Merkel’s party has indicated that she will back Sarkozy’s reelection candidacy, a crucial boost to his campaign. In the same interview, Sarkozy outlined several policies that were blatantly plagiarized from Germany. Germany must harness this growing political power and use it responsibly, especially at such an important and fragile juncture in European history. Regardless of German public opinion, Germany should continue to support bailouts for failing European economies, albeit conditional ones. If Germany allows the euro zone to fall apart, it will lose much of its trading power and its economy will suffer. Germany’s thriving exports—the driving force of its economy—are facilitated by the openness of internal trading in the EU’s and the weak euro. With the failure of the eurozone, Germany will lose these economic advantages. Additionally, by letting the EU devolve into economic irrelevance, Germany will lose an effective diplomatic tool. To a great extent, Germany controls which nations trade with the EU and which nations gain membership to the EU. By dangling the perceived economic benefits of trading with, or acceding to, the EU in front of otherwise recalcitrant nations, Germany can push political reforms. A fallen EU is far less attractive; if Germany allows European economies to fail and thus strips the EU of its economic power, Germany will sacrifice one of its main diplomatic tools in producing democratization and liberalization around the world. Suffice it to say, if Germany truly wants to adopt the role of power broker in Europe, it must be prepared to meet the diplomatic requirements of such a position. World Economic Outlook Database. IMF, Sept. 2011. Web. 6 Mar. 2012. “Germany’s Angst.” The Economist. The Economist Newspaper, 17 Nov. 2011. Web. 07 Mar. 2012. . The Economist. The Economist Newspaper. Web. 07 Mar. 2012. .
“Love in a Cold Climate.” The Economist 4 Feb. 2012: 54-56. Print. Re:Sebastian Brady’s article on Germany. As a layman, I agree with your conclusions about Germany. They are a hardworking people and there is much to admire about their handling of the current crisis. My concern, though, is that you utilize the present conditions to predict what might or should be done by the Germans. You didn’t present any references as to how the past could be a factor. Should the German leadership assist most of the rest of Europe financially and demanding austerity, the citizens of Germany will not take kindly to the protests and riots that will ensue. And they could perhaps elect a leader who reflects that resentment. I guess my point is, as wonderful as the German people are, it wouldn’t be the first time that German nationalism takes a rather harsh turn into something more. You should have mentioned that. Still though, I liked what you said and hope for the best.